Brazil's right-wing presidential frontrunner Jair Bolsonaro was transferred Friday to a hospital in Sao Paulo, a day after being stabbed while campaigning, a hospital official said. "Patient Jair Messias Bolsonaro recently left... and went to the Albert Einstein hospital," a spokeswoman for the Santa Casa de Juiz de Fora hospital said. Bolsonaro underwent surgery on Thursday for multiple wounds to his mid-section and was listed in stable condition after the attack in the southeastern city of Juiz de Fora. The attack was the latest bizarre twist in a presidential race in which the most popular candidate, former president and leftist hero Luiz Inacio Lula da Silva, is trying to run from prison. The Supreme Court disqualified Lula on Thursday. First round voting is scheduled for October 7. 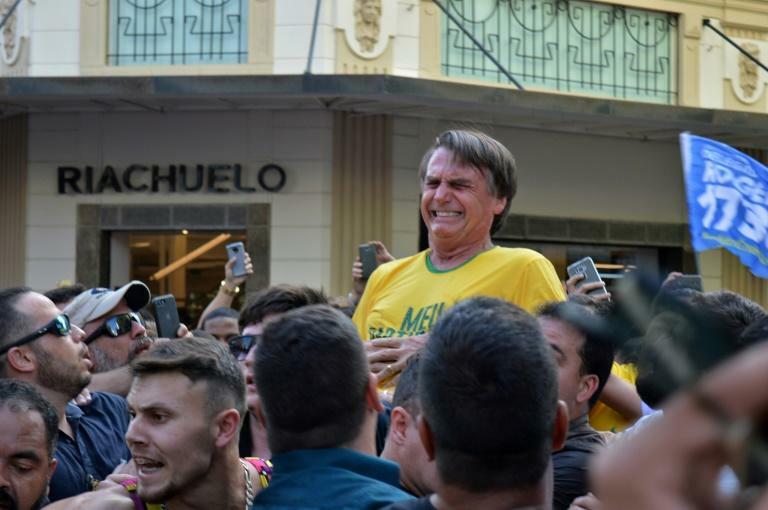 Images shared on social media and Brazilian television showed Bolsonaro being carried on the shoulders of a throng of supporters, before a man lunges at his stomach. A witness told police the attacker held a knife wrapped up in a shirt and attacked Bolsonaro as the group hoisting him walked by. The attacker was arrested immediately and identified as Adelio Bispo de Oliveira, 40 -- said to have been a member of the left-leaning PSOL party. After his arrest, Bispo de Oliveira said he was "carrying out a divine mission, a mission from God," said Luis Boundens, head of a union of federal police officers. Authorities are investigating the suspect's mental health, he added.